The field margin is the area of the field between the crop i.e. grass, barley etc and the boundary. 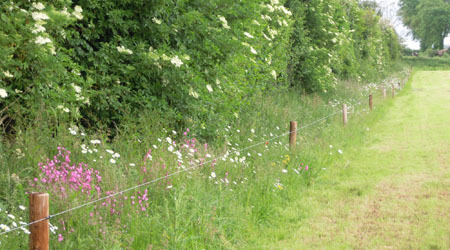 The boundary is more often a hedgerow but can be a wire fence, roadway, wall or another natural habitat. With intensive agriculture the field margin is often absent in modern farmland. Land area is one of the limiting factors to a farm’s productivity and so the tendency is to grow the crop right up to the field boundary. This means one less habitat on the farm. The BRIDE Project encourages a width of 2m on the boundary of each field. Grassland; Ensure the field boundary is protected from livestock. If the electric fence is adjacent to the hedgerow, relocate it 2m out from the base of the hedge. Tillage; Allow a 2m field margin between the crop and base of the hedgerow. • No pesticides should be used in this habitat. • Area should be flailed with a hedge cutter annually, as late in the year as possible and before the hedge cutting close season (March 1st). This habitat is important for all types of flora and fauna. Long grass will benefit many insect and butterfly species. Wildflowers will form a nectar and pollen rich habitat for pollinating insects and the dense undergrowth will provide cover and food for hedgehogs and small mammals such as bank voles, shrews and wood mice. Also an important foraging and nesting area for many bird species such as yellowhammer.